Beyene Haile was born in Asmara in 1941. after graduating from the American University of Beirut in 1963 in public administration and political science, he went on to get advanced training in these areas in Italy, Senegal, and Swaziland. Till 1992, he worked in Addis as a training ad management consultant in various private and public institutions, government ministries, and international organizations. After Eritrea’s independence, he shifted to Asmara, and used his extensive experience in training and management in his work on projects of the government and international organizations. He is still active as a consultant, and has written several book-length manuals and produced a considerable amount of training material for his numerous clients. 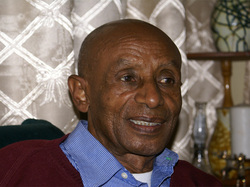 Aside from being a thorough professional, Beyene is also a sensitive artist, which is reflected in his serious and abiding involvement with art, music, and literature, stimulated partly by his family background and partly by his dreamy disposition, which shaped his extraordinary belief in the curative powers of the imagination. Right from his schooldays he has been an avid student of painting as a form of creative expression, and a painter in his own right, having held exhibitions in several African countries and in Italy, and featured also in Taye’s Ethiopian Painters. His sustained interest in diverse traditions of music and art has made him into a writer who is very different from his contemporaries at home and abroad. During Eritrean people’s fight for independence against colonial masters, when virtually all the Eritrean writers used the major modes of literary expression—poems, stories, novels—to promote awareness about colonial oppression and help build people’s resistance to it, which some elevated almost into a mystique, Beyene wrote fiction to celebrate the triumph of imagination, in which art liberates the spirit and forges bonds of love. His first novel that revolves round the life of a painter quite understandably did not find favour both with the critics and the public when it was published in 1965. Because of this, he waited for things to change, and wrote his second novel after an interval of nearly forty years, by which time his early novel was enjoying a revival. The new novel was an instant success, and has been hailed widely both by readers and critics as a pleasing new voice in Tigrinya fiction, in which literature weans itself away from its heavy involvement with the strident politics of the pre and post-colonial era. This conversation owes its origin to my earlier interview with Alemseged Tesfai, another distinguished Tigrinya writer. When I asked him about writers who in his view were creating new possibilities for the growth of Tigrinya literature, he instantly named Beyene Haile as one of the major ones. So I requested Beyene for a meeting, to which he kindly agreed. Because it went off very well, we met several times after that to talk about his literary career, the nature of his writings, and his views on art, the role of a writer in society, and about the contemporary literacy scene. The written text of the interview too has gone through several drafts. The one published here is the final edited version, which has the approval of the author. TND: From whatever little I know about Tigrigna literature, I find your writing different from that of the other known and established writers. How right is it to think of you as a writer who is truly different from others? BH: Though I am not sure whether being different makes one better or worse than others, it is true that I am different from many other Eritrean writers. In fact, I share very little with them. I think and act differently; my novels too differ from the novels of other novelists, both in their content and style. TND: Any possible reason(s) for this difference? BH: I think that it maybe because of my background: education and tastes. I have been interested in painting right from my boyhood. In high school, I had the benefit of advice from knowledgeable tutors, and access to art materials and art books. Painting made me into a visionary of sorts, and gave me the kind of creative freedom that I craved for. I learnt to live on my own, in my self-created art-world. I also learnt not to bow down to conventions, and to chart my adventures into the human landscape. I acquired a new vocabulary, which differed radically from that of my contemporaries. Solitude became my fate. I perceived myself and the world around me differently. I had also the benefit of enjoying two religious traditions through my families: Eritrean Catholic of the Eastern Rite and the Coptic Church. Their common rituals provided me entry into social gatherings that provided food, music, and dances. This not only shaped my faith but also enriched my interest in music, painting, and language. TND: Considering your background and education and your artistic bent of mind, it seems obvious that your inclination to write should have been different from that of the others. If in their case the main stimulant was the colonial situation, what was it in your case? BH: When I was born, the Italian colonizers had just made way for the advent of the British Administration (1941-1952). A decade long federation followed to mark a period of uncertainty (1952-1962), because the British passed us on to the Ethiopian occupiers, who traitorously lingered on for nearly three decades, resulting in a dark period of war and famine in our country. We all had to go through fifty years of repression and hopelessness. Like many others, I suffered the pain of colonization, and hated it. It had robbed me of my dreams. The bitter pill of colonialism kills hope, and I had my share of it. My first novel reflects an aspect of colonialism, which I have discussed at some length in my long essay “The Author in Search of a Character.” However, I need to clarify that I do not deal as much with the colonizers as with the mentally colonized. It is about my surroundings and me. It is against the intelligentsia who do not use art to heal the beaten soul. It is against people who do not seek freedom through art. In a way, it condemns a certain kind of society and its philosophy. My second novel ‘Duquan Tiberih’ is also against the intelligentsia who though possessing knowledge lack wisdom and imagination. The book presents characters that, unlike many intellectuals, derive pleasure out of creativity, vision, and adventure. Both books have characters that stand for art, progress, and love. They are presents to my people, as symbols of a way of thinking that makes life liveable, and are memorable for their unusual visions and actions. TND: You seem to suggest that though intellectuals have an important role in society the ones that you see around do not do so. Would you kindly elaborate on what kind of intellectuals you have in mind? BH: Those who possess a measure of education can hardly be called intellectuals. I tend to describe them as intelligentsia, an elite who has the benefit of acquiring various technological and social skills and expertise. Without dwelling on terminology, the educated are mostly concerned with the betterment of their life by using their skills. They do not spend enough time writing and educating people. I do not see them producing technologies designed to improve the wellbeing of the people, nor do I see them writing to enhance creativity. TND: You also seem to think that art is a kind of substitute for political action. What about resisting and fighting political oppression? BH: There is no doubt that art speaks for truth and beauty. It has always been so since the ancient times. Great writers have influenced politics by enlightening readers on social and political issues. Through literature, dictators have been exposed, ideal states have been sought, and good leaders have been commanded. However, I do not think that art is (or should be) a substitute for political action. Art can never be a substitute or a slave. It must stand on its own, as one of the highest expressions of beauty and truth. TND: How did you start your writing career? Directly with the publication of your first novel, or did you write anything else before that? My first novel is my first coherent piece of writing. I wrote it impulsively, because my whole being dictated it. It was my nausea of sort; it was a statement I had to articulate. I had to tell it all no matter what the consequence. I paid dearly for it because it was ignored by readers. I could guess though that their failure to read it was because it was not their meat. Their education and mental make had not prepared them to read such books. I had to wait for thirty years for its recognition by the general public. TND: This kind of novel certainly must have been unusual in the turbulent times of 1950s. What was your intention in writing it? It obviously did not have much to do with contemporary reality. BH: I wrote the book in 1959, but published it in 1965. To my young mind, it was an answer to the times, though many people did not think like me. I thought it was a challenge to the times, though my perspective was different. The issue at its core did not fit the cultural ethos of the times, for I dealt with creativity, imagination, and freedom, and not directly about the roar of guns. My concerns seemingly did not figure as worthwhile issues for the society, and to the so-called educated people. That is probably why they did not understand it the way I had intended. Although it has elements directed at the colonial government, it did not make the kind of dent that other works of the times did. The readers did not feel the pinch of the dart I hurled at them. To them, I was almost like an insect biting at the skin of an elephant, but to me they were tiny insects who did not have the ear for the roar of a lion. There was a big gap between my perception of reality and that of the society at large. I guess the colonial education had a lot to do with it. People had hardly any idea about the liberating power of art. Most people were like up-rooted trees thrown on the sidewalk of cities and towns. The teachers and administrators were no better. TND: You suggest that the novel had a poor reception. Is there anything special about this response? Is it still in print? BH: As I have already stated, it was not well received. Possibly because it did not look like the books readers were used to. Even the writers did not show any interest in it. I think the problem with most of the people was that they could not identify with my hero, Mezgebe, the painter who painted differently and behaved strangely. I am happy to say that the same is not true about the book now. It is still in print, and in its third printing. This in itself reflects the changes that have taken place in the socio-economic structure of our society. It has matured through wars, endless hardships, and finally, freedom. TND: You wrote your second novel after a long time interval of forty years. This seems rather puzzling. What did you do during all this time? I think I was disgusted by the response to my first novel. May be I realized that my style did not fit in with the temper of the times. The Amharic and Tigrina books in print hardly related to my perception of novel writing. I could see that readers were not ready for me. Therefore, I kept myself busy with other things. I started scribbling poetry in English. I also worked on a Tigrinya novel, which is still unfinished, and wrote a few poems and some essays too. But mostly I bided my time and concentrated on my paintings. Soon after, I became a free person, a free Eritrean, and a free writer. This virtually opened up my sub-conscious being. I responded to this new awareness with tremendous energy that had lain dormant. Finding the right kind of climate for my creative endeavours, I virtually exploded. I experienced a new love for my country and my people. I saw everyone happy to build a new country, to play music. I loved what I saw. It gave me vitality, hope, and a sense of adventure. I also witnessed the tragic situation of the intelligentsia, as if they were afraid to face freedom and its consequences, demanding privileges before fulfilling obligations. TND: From whatever I have heard about it from others, including some known writers, and whatever little I have read about it, your novel marks a clean break from the long established tradition of novel writing in Tigrina. How aware have you been of this tradition? And how does your novel depart from it? BH: The novels that trickled down during the time I was literally hibernating did not impress me as works of art. However, they strengthened my conviction that I could tell a story in my own style. I think it would be more true to say that they pushed me into writing my own kind of novel, which obviously would be different from what I had read. It did not strike me that my writing was a break from any tradition. For even my first novel was different from the novels of its own time. In a way, therefore, I continued with my old style, but it certainly was tempered with experience. I think I have been an indiscriminate reader of books starting from high school until the present time. I have read most of the classics of European and American literature. My basis for selecting books (novels) and authors has been artistic creativity, style, originality, and bold step the book makes into the still undiscovered realm of the human spirit’s quest for meaning. Political considerations have little impact on the kind of books I love to read. In the sixties, when many friends preferred to read Gorky’s ‘Mother’ for its socialist content, I enjoyed Camus’s ‘The Stranger’ for its existential mood. I have always believed that art is beyond the boundary of socialism, capitalism, and imperialism. It should not be limited to political concepts. I think truth and beauty could suffer if art is enslaved to serve only political or economic purposes. If ever engaged in a description of political situation, it should espouse enduring human values of love and freedom. It should look down on actions that degrade human worth. TND: From what you say, this novel has many interesting and significant aspects to it, which do reflect your concern about what is happening around you. Please elaborate on this by telling us more about the book. BH: Speaking broadly, the novel shows how people responded to their newly-acquired freedom. In the process, it exposes the limitations of individuals, their government, and their social set up too, because they fail to capitalize on their opportunities due to their lack of knowledge, experience, and exposure to creativity. The title of the book, Dduquan Tberih, means Tiberh’s Shop; it is a unique shop that sells assorted articles available in several boxes. Every shopper is presented with a box and asked to take out the things that s/he needs. Though the exercise seems simple, many shoppers fail to pick things because they are not sure of what they want; some cannot even recognize the things they are looking for. Very few actually know what they are after and find it. The shop and its exotic business style becomes the subject of highbrow discussion among the educated who hail the practice as an ingenious Eritrean contribution to the rest of the world. They praise the freedom of choice given to buyers. Some, of course, consider the shop and its clientele as an allegory, which stands for the wealth of Eritrea that is unfortunately not seen by the blind intelligentsia of the country. In another part of the novel an Eritrean archaeologist finds similar-looking inscriptions in three separate mountains. These are graphic descriptions of a mouse goading an elephant on one plate and an elephant goading a mouse on the second plate. These are analyzed by the learned as a guide for action in ancient Eritrea. They believe that Eritreans could use the symbols for realizing their projects. They could suggest that the work to be done is huge like an elephant and cannot be completed until the worker becomes stronger than the elephant. They could also mean that the one who wants to do something without having the required skill shrinks to the size of a mouse while the work expands to the size of an elephant. These and similar allegories abound in the book, and the intention is to inspire Eritrean society and government to be more creative thaN what they are. TND: I must say that sounds quite novel and interesting. Have you written anything else? BH: Yes, a novel as long as Duquan Tiberih. It is neither a sequel nor a part of a trilogy. Apart from some short stories and essays, I have also written a play ‘Heart to Heart Talk,' which is likely to be published soon. It contains an introduction and detailed notes for its possible production, next year. I have also done a preliminary translation of the play into English and may succeed in publishing this too. TND: I am compelled to ask you how you see yourself in relation to your contemporaries—as a craftsman and with a credo of ones own. BH: I see my contemporaries within the Eritrean realities. I cannot say much about the contemporary Africans writers because my knowledge of African literature leaves much to be desired. My reading has been haphazard and governed mostly by what I learnt about writers and their work through the popular press. My perception of art is different from many of my Eritrean contemporaries. I have not been able to share my views of art with them, because they have never been inviting. So I kept to myself and wrote and painted without any regard to their thinking or response to my work. I have crafted my novels on my own, without any respect for established conventions or popular trends. Through free association of my experiences and imaginations, I have created under many states of consciousness. I use my imagination to its utmost limits of creativity: each word, phrase, and sentence is a product of careful deliberation. TND: Given the special position that you have made for yourself and your varied interests in life, how do you look at the literary scene of your times? BH: The literary scene can be viewed from two angles. Since independence, writing has been popularized. More people are writing now than before. The young are writing poetry, short and long stories, and scripts for films. There is also an attempt at literary criticism, and literary circles have spread among the youth. However, there is need to improve the quality and quantity of what is being produced. Unfortunately, the critics are hardly helpful in making this possible, and there are no role models either. We have no publishing houses to encourage new talent. The number of published literary works – fiction, short stories, and poetry – continues to be meagre. I wish for a big transformation, a real big change. A new class of writers has to be encouraged to enrich the literary scene. All schools and colleges have to play an active role in this. TND: Do you believe that writers have any special obligation towards their people? Has this in any way influenced your own writing? BH: The life of people is actually the main subject of writers. I think people are his inspiration, his raw material, his protagonists, as well as his readers. It is inconceivable to think of a literary work without them. They are always in the mind of the writer. One obviously cannot recite writings to the sea, the mountain, or the wilderness. The writer addresses human beings, even though in love with the fauna and the flora. A writer having an obligation towards his people sounds rather heavy and loaded. I believe that a writer is bound to his people by love. There is no drive stronger than the desire to be connected, the desire to tell loved ones your stories, I mean, all sorts of stories. To this end, the writer devises a style, picks words and phrases that go well with them. The creative writer is neither a leader nor a teacher, though some do aspire to be like one. He is a fellow wayfarer, a traveller in search of something to hold on to, and a companion to friends who enjoy stories. If the writer thinks that he has a message, it can only be the message of love. He loves them so much that he does not want to see them suffer. He wants to entertain them, to encourage them to laugh, to tell them not to be afraid of impotent teachers, administrators, managers, parents, merchants, and powers. He wants to tell them that the source of his secret, the mystery, and the beauty in his books belongs to them. He thrives on their love. TND: Are you satisfied with what you have done and achieved till now? BH: Yes, I am. I think I have said it all on top of a mountain. I have shouted “I love you!” to humanity. I have been able to tell my readers that they are beautiful, and that I love them. Their response has been encouraging. I hope my books get a similar response from the rest of the world, for my books are addressed to them, too. TND: Any special dreams, ambitions that you still cherish? I have recently written a play that I wish to see performed on stage. I may write one or two more plays. There is a strong dramatic quality in my novels. I hope to see some dramatic parts extracted from them to stand as plays in their own right. I am also collecting short stories for publication. Some day, after I write more of them, I hope to get them published. I want to help young writers find their true selves. I want to organize writers’ workshops, of critiquing sessions, to help them write. I have already started visiting young writers’ clubs to talk to them about writing good stories. I want to know them better and share my experiences with them. Maybe, I will also come up with a novel closer to my heart, a novel that speaks to me and my readers with love. There is always a gap between desire and achievement, dreams and reality, wishes and actualities. My books are only a fraction of my vision. That is why I wish to live a little longer, to write a fourth or even a fifth and a tenth book that comes close to my vision of a perfect story.